As soon as I walked into the Can Can Parleur Organic Hand and Foot Spa from the gritty bustling streets of the revitalized La Brea neighborhood that is now packed with some of the best restaurants in Los Angeles, I was transported to a Parisian escape, without ever having to leave LA. The first thing that melts the traffic noise away is the decor and the bubbly that is presented to you soon after walking in. 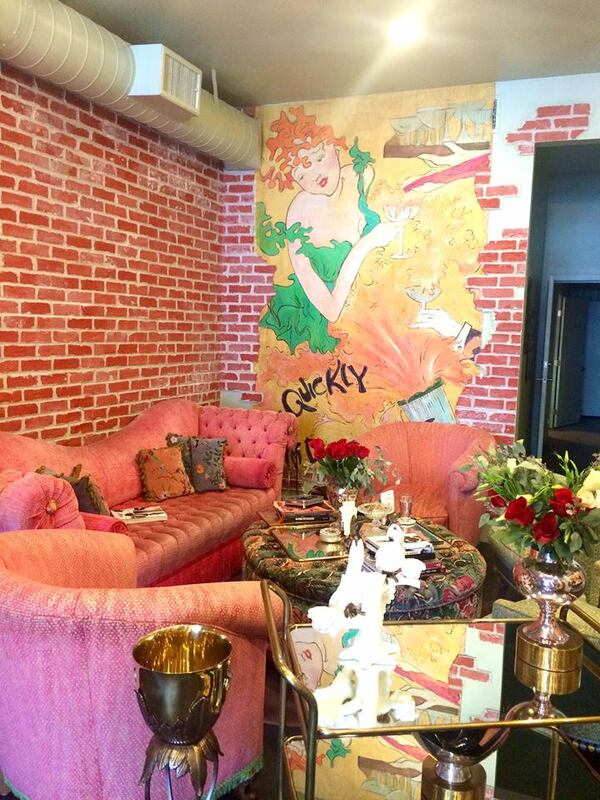 This Parisian parlour leaves no detail behind as each wall showcases Moulin Rouge-esque paintings of the Can Can and embroidered chairs and cushions matching rich ornate tapestries, almost like being in somewhat’s private boudoir. This is no ordinary mani pedi. If you are looking to unwind for a few hours (at least three), than this is the spot! After my warm water was dumped onto my feet from a rustic vintage pitcher, rose petals and sprigs of rosemary adorned my milky water mixture. Sit back, and relax! 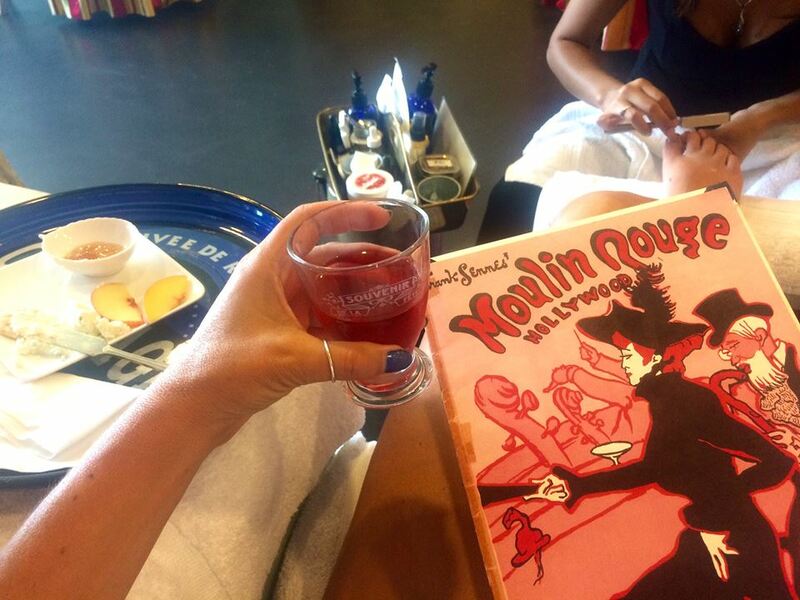 Enjoy your bubbly as cheese and crackers and tasty bites come your way while your feet get a rub down. A young girl worked expertly on my nails with a milk and honey scrub followed by my very first foot treatment that included rose lavender paraffin lotion to moisturize my feet in warming booties, and then repeated again with my hands in warming mitts. This treatment indulgence includes a lovely massage with their signature Vive La Rose lotion, and an amazing polish job. This is not the place to go if you are in a rush. 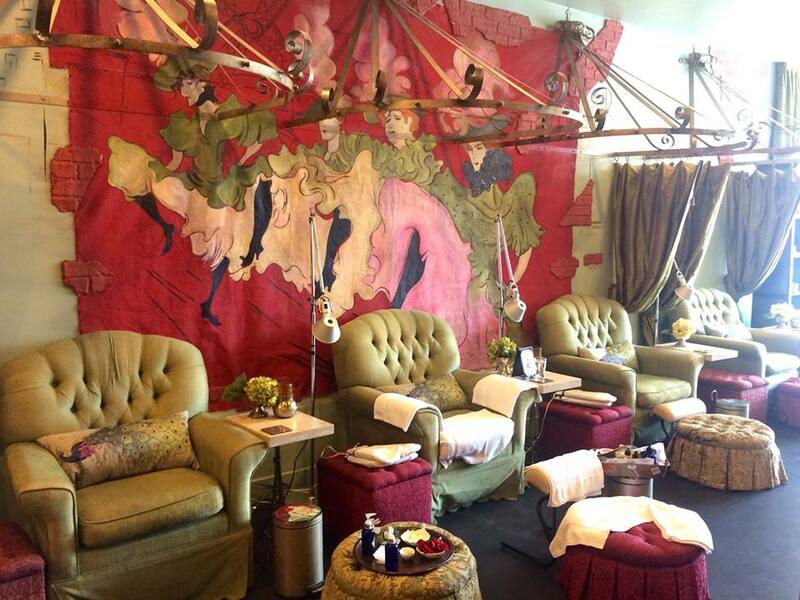 Relax and experience each luxury, which runs around $70 ($30 manicure/$40 pedicure) for Le Can Can Signature. Vive La Rose! is tres expensive and will run you $230, but there are a menu of luxurious treatments to choose from. Quicker, less expensive options are also offered. Since everything is organic, there is no nasty smell wafting from this salon. 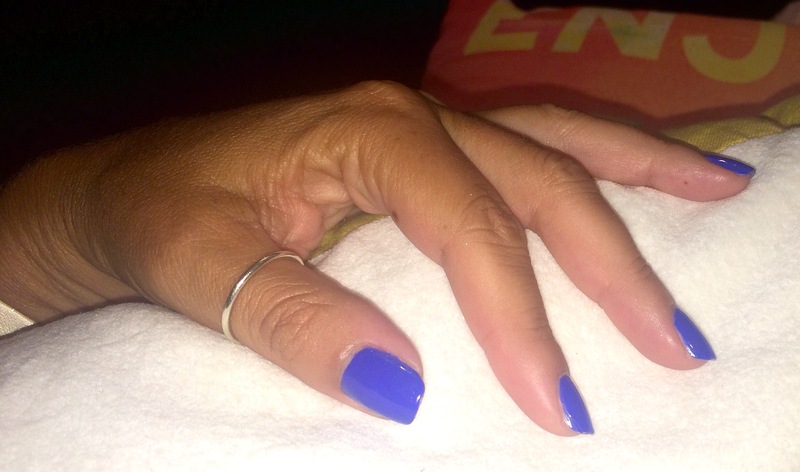 I chose bright blue Essie nail polish to compliment my summer tan. The owner Carolann is a kind women who put a lot of thought into the customer experience. You may wander, Why Can Can? Why Moulin Rouge? Well, she had a passion for this bygone era, “La Belle Epoque,” a period in European history when peace and prosperity in Paris allowed the arts to flourish, and many masterpieces of literature, music, theater, and visual art gained recognition. Thus, Carolann turned her dream into reality, right here in Los Angeles. A dreamer’s city where anything is possible! 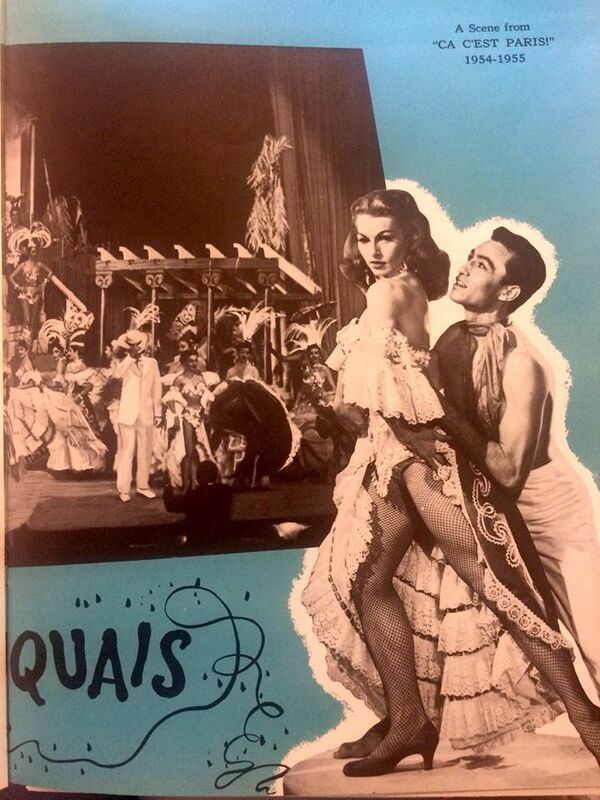 What I learned while reading their menu of services is that right across the way was once a Los Angeles version of Paris’s Moulin Rouge that was a big hit and operated in the 1950’s. The menu includes many black and white photos and a detailed history of what was once Frank Sennes Moulin Rouge Theatre Restaurant. Thus, the location in spirit is very fitting. 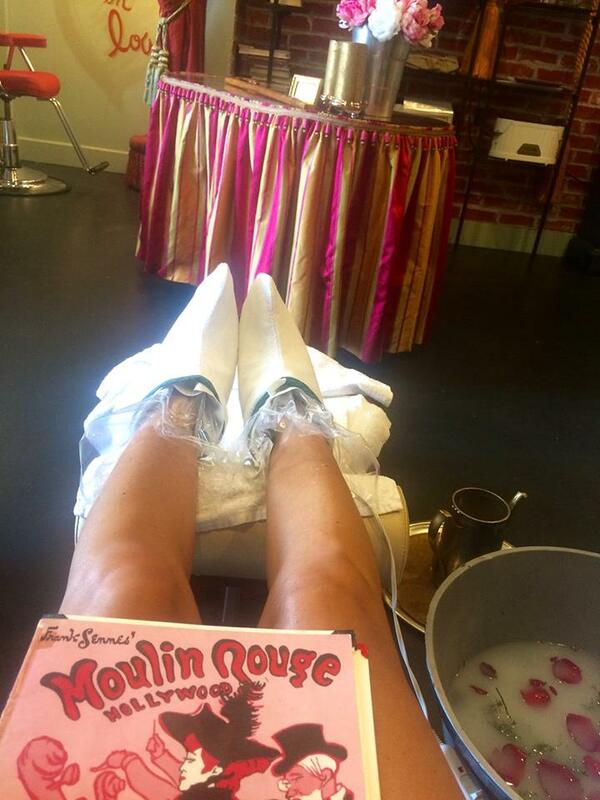 A private massage, reflexology, depilatory services, or a an organic personalized spray tan are other services that are offered at this one stop beauty shop in elegant decorated rooms fit for a Parisian queen. This dramatic space can also be rented for Parisian Soirees aka private parties, Girls’ Day Out, expectant mothers, or bridal celebrations. The Can-Can Parleur’s mission seems to be one of ‘Let’s have a feast for your senses, from the moment that your eyes take in the opulent aesthetic of the beautiful Salon, to when you resign yourself to surrendering completely to being in the moment.’ MY final moment ended with a dreamy chocolate truffle morsel melting in my mouth while my nail polish dried. 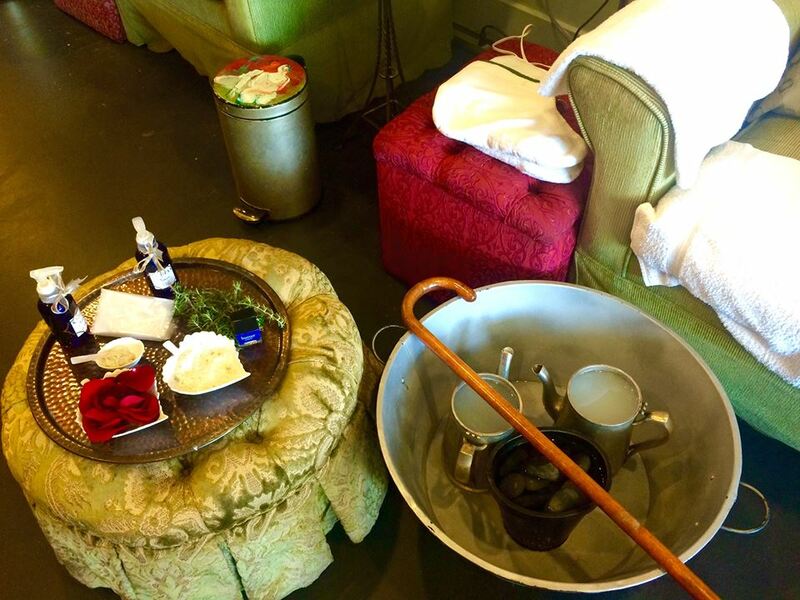 2) Tell us why you would like to be chosen for this special Parisian pampering day under one of our Can Can Parleur photos on our LaLaScoop Instagram or Facebook and @ or write which 2 friends you would like to bring. Bon Chance! 3) Stay Tuned. One lucky winner will be announced via LaLaScoop Facebook and LaLaScoop Instagram by Friday. Seriously, Carolanne is a master of sent design. Never experienced anything like it.